Long jumper Anju Bobby George raised the blanket of gloom surrounding the Indian camp a little bit with her first leap at the Olympic Stadium here last night. The Indian sailing duo of Malav Shroff and Sumeet Patel expectedly finished at the bottom of the table after the final race in the Mixed Open Double-handed Dinghy 49er races in the 28th Olympic Games here today. Olympic silver medallist Major Rajyavardhan Singh Rathore today said the underdog tag helped him focus better on his job as he could remain away from the limelight. Having being snubbed into a state of shock by their pathetic performance, a completely demoralised India will be seeking to round off their disastrous Olympic campaign with a face-saving victory against South Korea in the final classification match here tomorrow. Holland were left ruing missed opportunites as German eves upset their more fancied rivals 2-1 to claim their first ever Olympic hockey gold here today. Germany's win must have provided some consolation to their men's team which was tamed by Holland in the semifinals yesterday. The triumph was also a perfect revenge for the Germans who had lost the league encounter between the two sides last week. National record holder Bobby Aloysius crashed out in the preliminary round of the women's high jump failing to cross 1.89m at the Olympic Stadium here today. The 30-year-old Indian cleared 1.75m and 1.80m on her first tries before fumbling in the first attempt when the bar was raised by another five centimetres. Dwight Phillips of the USA completed a hat-trick of global long jump titles when he crushed the field with his opening leap in Thursday's final to win the gold. The 2003 world champion indoors and out set the standard with his first jump of 8.59 metres. It was one centimetre off his best, set in Austria three weeks ago, 28 cm better than anyone else in the field had managed this season and better than anyone else in the world had produced for four years. Iranians swelled with pride today after weightlifter Hossein Rezazadeh confirmed his status as the world’s strongest man at the Olympics. 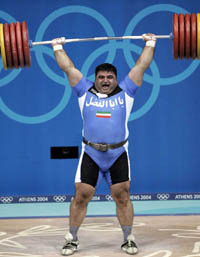 Known affectionately as the “Iranian Hercules”, Rezazadeh equalled his own world record total lift of 472.5 kg with an ease and panache that crushed super-heavyweight competitors. “I was so proud because this year we sent Hercules to Athens,’’ said Shirin, 35, a furniture designer in Tehran. Greece’s Fani Halkia exults after winning the women’s 400 metres hurdles final in Athens on Wednesday. 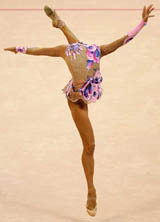 Halkia won the gold medal in a time of 52.82 seconds, ahead of Romania’s Ionela Tirlea-Manolache and Ukraine's Tetiana Tereshchuk-Antipova. Ukraine have lost the bronze medals they won in the women’s quadruple sculls on Sunday after crew member Olena Olefirenko tested positive for a prohibited stimulant. Decked in a white and gold outfit, popular Ethiopian singer Ejigayehu “Gigi” Shibabaw sang the praises of Ethiopia’s current and former Olympic champions Kenenisa Bekele and Haile Gebrselassie in an Athens Club last weekend. ATHENS: The world athletics’ ruling body, the IAAF, announced on Thursday that a doping review board would start an immediate investigation into the cases of Greek sprinters Costas Kenteris and Katerina Thanou. Two things are absolutely necessary to remain among the toppers in international cricket these days. First you have to survive the rigours of the game, which is also a learning experience and then have to cultivate and know the way to fight back in case of failures. Merwyn Chen of St Michael’s Senior Secondary School, New Delhi, won the under-19 boys 200m freestyle event on the opening day of the three-day inter-state school swimming championship at Nehru Stadium here today. Mridul Sunil Kumar of Alpine International, Ludhiana, secured the second position while Karan Malik of Bal Bharti Public School, Pitampura, was third. 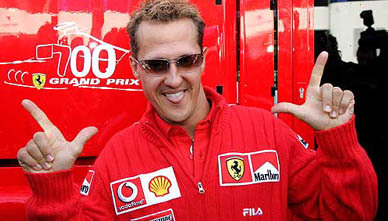 Ferrari's world champion German rider Michael Schumacher poses for photographers ahead of the Belgian Formula One Grand Prix at the Spa-Francorchamps race circuit in Brussels on Thursday. The race was omitted from the world championship calendar last year because of a ban on tobacco advertising but it was reinstated this year to host the 14th race of the season. The race will take place on August 30. Long jumper Anju Bobby George raised the blanket of gloom surrounding the Indian camp a little bit with her first leap at the Olympic Stadium here last night. But the danger remained a day later that the officialdom would try to bask in the reflected glory if and when she climbed the medals podium tomorrow in the finals scheduled at 10:35pm (IST). After looking for excuses and places to hide in the aftermath of the shameful doping scandal involving women lifters Pratima Kumari and Sanamacha Chanu, the plethora of officials accompanying the participants had been forced into a tight corner. They were fervently hoping for Anju to bail them out and the talented and lissome Kerala woman obliged them by accomplishing the first part of her mission to become the first-ever Indian Olympic medal winner in athletics. The 27-year-old Anju has a very difficult task ahead of her when the top 12 competitors in the event assemble at the long jump pit tomorrow night to renew the battle for glory. But the fact is she has done what no previous Indian male or female has ever done at the biggest sports show on earth, to reach the final of a field event. All other finalists from the country before her — Milkha Singh, Gurbachan Singh Randhawa, Sriram Singh and P.T. Usha — were track athletes. “My objective was to qualify for the final, that is the first step. I just played it safe and jumped from a little behind. I did not stretch myself much, did not go for distance,” she said after leaping into the final with minimum fuss. “I am happy that I have made it to the final. The real competition will come in the final, so I am just preparing myself for it. There I will try to give my best,” the 27-year-old world number six said. Anju has a personal best of 6.74m and a season’s best of 6.71m and will have to produce an incredible jump to be able to make it to the medal podium, a dream she has pursued with a great deal of determination. The biggest casualties of the qualification round were two veteran stars, Fiona May, the 2001 world champion, and Eunice Barber, who won the 2003 world championship gold medal when Anju was the bronze medallist. The defending champion, Heike Drechsler, has retired, leaving Marion Jones as the lone medallist from Sydney. Anju, whose best legal jump this year has been only 6.71m, jumped into a slight head wind of 0.2 metres per second and reached her first target. Irina Simgaina cleared 6.75m with her first leap and Jones fouled her first and then leaped to a distance of 6.70m in the second to keep alive hopes of an individual gold medal from these games, where she failed to make the team for the sprints. They finished 18th in race 16 with 18 penalty points and after the completion of the 16-race event, they finished a poor last in a field of 19 with a total penalty points of 253. Meanwhile, the Spanish duo of World Champions Iker Martinez and Xavier Fernandez bagged the gold with nine-point lead over Ukraine’s Rodion Luka and George Leonchuk who won silver. With 77 points, British duo of Chrish Draper and Simon Hiscocks won the bronze. It has been a horrible show by the Indians throughout the event. The US-based Indians, in fact, proved no match at all at the Agios Kosmas Olympic Sailing Centre and they have been struggling to keep their head above water right from the beginning. If the first race saw them finishing 17th in the field of 19, it was because two pairs, Perio Sibello-Gianfranco Sibello (Italy) and Marcin Czajkowski- Krzysztof Kierkowski (Poland), had been disqualified. They were pushed to the 19th spot in the second race before Malav and Sumeet finished ahead of the Japanse duo Kenji Nakamura and Masato Takaki to finish 18th in the third. Once again aided by circumstances in the fourth race, they finished 15th as four pairs—Nakamura-Takaki (Japan), Christoffer Sundby-Frode Bovin (Norway), Czajkowski- Kierkowski (Poland) and Tim Wadlow- Pete Spaulding (US)—finished on the course side (OCS). In the next race too, the Swiss pair of Christopher Rast and Christian Steiger ended up OCS and the Indians finished 18th. In race number six, eight, nine, 10, 11 and 12 it was the usual lacklustre show by the Indians who finished last on all the occasions even though they managed 18th place in the seventh, ahead of Nakamura and Takaki. The 13th race saw the Indians being penalised after they did not start(DNS). They finished last in the next race and came 17th in the 15th race after the Australian pair of Chris Nicholson and Gary Boyd ended up OCS and the German duo of Marcus Baur-Max Groy could not finish (DNF). Olympic silver medallist Major Rajyavardhan Singh Rathore today said the underdog tag helped him focus better on his job as he could remain away from the limelight. “Only a few people believed that I could win a medal in this Olympics and probably that was the reason that I was overlooked while some others were in the limelight before the departure to the Athens. “But this underdog status proved to be a blessing in disguise because I was able to focus better on my job,” Rathore told PTI. 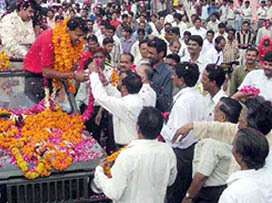 The ace shooter, who was back in the Pink city, after his heroics at the Athens was accorded a red carpet welcome by the state government with Minister of State for Sports Younis Khan accompanying him right after reception at the small town, Shahajahanpur, situated at the Haryana-Rajasthan border. Recalling the event in Athens, Rathore, who won the medal the double trap shooting event, said his concentration had disturbed for a while when the scoreboard had some technical problem and it was not keping pace with shots fired. “It had to be repaired and unfortunately I was shooting at that time. The break did affect my rhythm to certain extent but I was lucky to come back and win a silver. When asked whether he expected a medal there, Rathore said “for the past few years I have been putting hard work and planned thoroughly. This was the reason that I had hired foreign coaches Luca Merrini (Italy) and later Mark Russel (Australia) who both were world class shooters during their days.” Rathore said he was confident about his performance before the competition but also gave credit to the government and the Army for his latest success. “I was pretty confident about my performance. I am thankful that I was provided all help by government, Army and many others,” said an elated Rathore. When asked about those who could not win a medal, the Armyman said he did feel sorry for them. Rajyavardhan also had a few words for budding shooters of the state. “Determination, security and resources are must for success and train under experienced shooters,” said Rathore. He promised to advocate for a shooting range in the capital to help continuing the legacy of former shooters like Karni Singh. “I would also come to coach the budding shooters,” he said. Praising the Army for its contribution, Rathore said his success was only the tip of the iceberg. Rathore who has been promised a cash award of Rs 11 lakh and an MIG housing board flat, said he was not rueing about whatever he has been promised. “What ever has been promised to me is sufficient to motivate children who will take up sports,” he said. The Indians, who had talked of making it to the semifinals before the Olympics, are now fighting for the seventh place in what has been a highly forgettable tournament for the team, struggling to find any kind of form. Not only have they failed to secure a berth in the semifinals but the 0-3 defeat at the hands of traditional rivals Pakistan yesterday has also shattered their hopes of making it to the prestigious Champions Trophy tournament. While the Indians have no option but to play for lesser positions, defending champions the Netherlands will seek to retain the title for a record third consecutive time when they lock horns with Australia, in what promises to be a thriling final tomorrow. The Indians have not only looked disjointed but have not learnt from the mistakes as the players keep commiting the same mistakes in every match to continue their downward slide. Coach Gerhard Rach is at his wits’ end to bring out the best of a talented set of players who have for some strange reason failed in virtually every department of the game, except for goalkeeper Adrian D’Souza, who has been the saving grace. But for D’Souza’s outstanding show under the bar, India’s plight would have been more humiliating as he has checked the margin of defeats with some brilliant saves, particularly in penalty corner situations. The defeat against Pakistan was the ultimate blow for Dilip Tirkey and his men as no match against any other team evokes so much passion. Though the Indians played a decent game in the opening session, the second half opened up the floodgates as the defensive lapses cost them three goals. “Nothing seems to have gone right for us in the Olympics. We are not being able to get going, that has been the problem. We were a little bit unluky in the earlier matches, which is affecting us,” Rach said. The injuries to some of the key players have compounded India’s misery as it has reduced the bench strength, which means that players have to play for longer spells. Rach admitted that some of the players were physically very tired but he could not substitute them because he did not have the bench strength. The Koreans, silver medal winner in the Sydney Olympic Games, are known to be a nippy outfit quite capable of piercing India’s patchy defence. Germany scored both their goals in the first half — Anke Kuehn from a penalty corner in the fifth minute and Franziska Gude in the 21st —before Holland reduced the margin through a Maartje Scheepstra strike three minutes into the second half. In the bronze medal match played earlier in the day, Argentina recorded a last-gasp 1-0 win over China with Luciana Aymar scoring in the final minute. Argentina, silver medallists in the Sydney games, were given a tough fight by the Asians, who had a good first 35 minutes in which they put some pressure on the opposition defence. National record holder Bobby Aloysius crashed out in the preliminary round of the women's high jump failing to cross 1.89m at the Olympic Stadium here today. The 30-year-old Indian cleared 1.75m and 1.80m on her first tries before fumbling in the first attempt when the bar was raised by another five centimetres. However, Bobby, who produced a career best and national record jump of 1.91m last month at Chennai to qualify for Athens, managed to clear 1.85m on her second attempt. But once the height was increased to 1.89m, the Keralite failed on all her three attempts and got eliminated from the final. He registered only one more jump, 8.35m in the final round, by which time the gold medal was already his. John Moffitt made it an American one-two when he improved his personal best by 18cm with a fifth-round leap of 8.47m while Spain's Joan Lino Martinez got bronze with 8.32m, also a personal best. Iranians swelled with pride today after weightlifter Hossein Rezazadeh confirmed his status as the world’s strongest man at the Olympics. Known affectionately as the “Iranian Hercules”, Rezazadeh equalled his own world record total lift of 472.5 kg with an ease and panache that crushed super-heavyweight competitors. “I was so proud because this year we sent Hercules to Athens,’’ said Shirin, 35, a furniture designer in Tehran. “He won because he believes in God,’’ the Islamic Republic’s Abrar-e Varzeshi newspaper said. “Iran’s national anthem was played in Athens, thanks to our champion,’’ said the state-run Iran newspaper. State television yesterday showed hundreds of people in Rezazadeh’s home city of Ardebil cheering and letting off fireworks to celebrate the local hero’s triumph. “We thank you for delighting tens of millions of Iranians,’’ Iran’s supreme leader Ayatollah Ali Khamenei said in a message. Rezazadeh, a devout Muslim who whispers a prayer before each lift, came from nowhere four years ago to win the crown and his title was never in serious threat in Athens. Fani Halkia sent host nation Greece into raptures as she produced an astonishing performance to pull off a stunning upset and win the Olympic Games women’s 400 metres hurdles. Halkia, a former high jumper who has improved her personal best by nearly three-and-a-half seconds in the past year, was greeted with rapturous applause when she was introduced before the race. The title favourite after her extraordinary 52.77 in the semi-finals, the sixth fastest time ever, Halkia looked supremely confident as she settled into her blocks. She drew level with Australia’s world champion Jana Pittman in the adjoining lane and pulled away steadily from the field to win in 52.82 seconds. The extent of Halkia’s improvement this year can be judged by her performance in the Budapest world indoor championships this year. Halkia clocked 52.90 for sixth place in the 400 flat final. On Wednesday, despite having also to clear 10 barriers, she was 0.08 of a second faster. Jamaican Veronica Campbell recorded a convincing win in the women’s 200 metres final over 18-year-old American Allyson Felix, clocking a personal best of 22.05. Setting a world junior record of 22.18 was little consolation to Felix. Campbell is only the second Jamaican track athlete to win an Olympic title. The third title of the day went to Russian women’s hammer thrower Olga Kuzenkova, who won a major title at last with an Olympic record of 75.02 metres after finishing second at the 2000 Sydney Games and runner-up in two subsequent world championships. Triple Olympic champion Marion Jones qualified comfortably for Friday’s women’s long jump final with her second attempt of 6.70 metres. American world high hurdles champion Allen Johnson was another to make a premature exit when he crashed to the track in his semi-final. Johnson, the 1996 Olympic champion, hit the fourth hurdle, fought back into contention, then tripped on the ninth and flew headlong into the 10th. The team has been disqualified, International Olympic Committee spokeswoman Giselle Davies said today. Australia will be promoted to bronze behind champions Germany and silver medallists Britain. Hungarian weightlifter Zoltan Kovacs has been expelled from the Olympics after refusing to take a dope test. Kovacs competed in the 105 kg class on Tuesday. Another Hungarian, Robert Fazekas, was stripped of his discus gold medal and expelled from the Games on Tuesday after being caught trying to tamper with his urine sample. Olefirenko had been prescribed medication containing the banned stimulant by her team doctor. 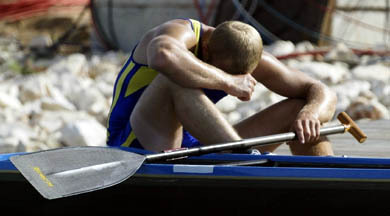 The IOC has urged the world rowing federation and Ukraine’s Olympic Association to consider action against the doctor. Under the IOC’s anti-doping regime there is a policy of “strict liability” under which an athlete is responsible for what he or she ingests, even if it is prescribed by a doctor. The 10,000 metres world champion and record holder Bekele had won in a Olympic record of 27.05.10 on Friday, followed by compatriot Gileshi Sihine, while the injured 1996 and 2000 champion Gebrselassie, who previously held both records, finished fifth. The medals count climbed with women’s world 3,000 metres indoor champion Mseret Defar and 5,000 metres champion Tirunesh Dibaba taking 5,000 metres gold and bronze on Monday. Bekele celebrated his victory modestly on Friday night, rejoicing with his teammates as they left the stadium. Callers included sports and government officials, family and friends and Bekele spoke to his siblings and his fiancee. “There is still work to be done,” said the double world cross country champion, who began his quest for a rare double on Wednesday by winning his 5,000 metres heat ahead of compatriot Gebre Egziabher Gebremariam. For the 300 Ethiopians, who gathered in the Galazio club in the Kipseli area of Athens, where the majority of Ethiopians in the city live, last Saturday was the right time to party. ATHENS: Australia’s baseball manager Jon Deeble cried foul after Cuba captured their third gold medal in Olympic baseball with a 6-2 win, arguing that a disputed call had stifled Australia’s drive for the title. “It changed the whole complexion of the game,’’ said Deeble, who was thrown out for arguing the call. ATHENS: FIFA President Sepp Blatter paid rich tribute to the Iraqi soccer team and said much of the credit for their Olympic success belonged to the sport’s governing body. Iraq defied extreme odds to reach the semifinals of the men’s tournament in Athens and, despite losing 1-3 to Paraguay, could still win a bronze medal when they meet Italy in the third-place match on Friday. MELBOURNE: “Pittmania” fell flat in Australia after hurdler Jana Pittman failed to pull off an extraordinary victory and even a national record haul of 16 Olympic gold medals offered the media scant consolation. Many Australians rose before dawn to watch world champion Pittman race 17 days after surgery on her right knee. The saying that the team is as good as it is in the last game seems to be true about the present Indian team. A team, which started progressing in the right direction in the last four years, appears to have lost its way. The problem is not exactly with individual players. Perhaps they have not been working out properly in awkward game situations. The Indian team has certainly progressed in recent times, but somehow is finding it difficult to sustain the level. The kind of cricket the team has played in the last six weeks clearly indicates that there is a slip up. India have failed to live up to the new standards set by the other teams. Every team management in the world makes it a point to dissect the successes of the other teams on the drawing board. The current Pakistan coach Bob Woolmer is famous for such practices. In fact, he was the first person to introduce the use of technology ideas in team meetings. No doubt, he has played a big role in India’s defeats against Pakistan in the last two encounters. Bob is known for planning out how to contain the key players of the opponents and bringing the best out of his own players. The excellent ability of the Pakistani players to cope with different conditions in Sri Lanka and Amsterdam kept their fighting spirits alive. I am sure it was a recipe prepared by the Pakistani coach in his laptop. Proper planning can undo even the big names of the opponents. It was very much evident in the last two months of Indian cricket. John Wright has done a decent job with the Indian team. He was no doubt the architect behind India’s success in the recent past. But I am sorry to say that it is time for him to wake up and bring in fresh ideas. The rain-abandoned game against the Australia did little to add to India’s confidence. Although Australians lost wickets at regular intervals in the rain curtailed 32-over tie, they had already imposed a challenging total. Michael Clarke, who played a blinder of an innings, made it clear that the Australian batting was deep and sound. The slowness of the wicket as well as the outfield would have had the Indian batsmen in a worry. In the under-19 girls 200m freestyle, Amrit Preet Kaur of SPS, Ropar, secured the first position, Swati Mautri of Vidya Devi Jindal School, Hisar, stood second while Sonia of Shah Sajnam Ji Girls School, Sirsa, was third. In other events of the day, Vibhor Munderi of KVM, Ludhiana, secured the first position in the under-16 boys 200m freestyle. Jagbir Singh of SPS, Ropar, was second while Rohit Gupta of Montfort School, Delhi, got the third position. In under-16 girls 200m freestyle, Needka Vats of KVM, Ludhiana, was first, Saumya Tara of Bal Bharti Public School, Pitampura, stood second and Indeep of Carmel Convent School, Chandigarh, secured the third position. In under-14 boys 200m freestyle, Vivek Yadav of Vivek High School, Chandigarh, secured the first position, Vikas of Shah Satnam from Sirsa was second while Iqbal Singh of Army Public School, Sangrur, stood third. In under-14 girls 200m freestyle, Ayush Gupta of Montfort Public School, Delhi, secured the first position, Jasleen Kaur of Gurnam Singh Public School, Sangrur, was second while Charu Chadha of Bal Bharti Public School, Pitampura, stood third. Earlier, the Parliamentary Secretary (Industry and Transport), Mr K.P. Rana, inaugurated the championship. More than 750 students of 98 CBSE schools from Haryana, Himachal Pradesh, Jammu and Kashmir, Punjab, Delhi and Chandigarh are participating in various events in under-19, under-16, under-14, under-12 and under-10 age groups. Addressing the gathering, Mr Rana announced Rs 1 lakh grant for the development of the stadium and for providing modern facilities to sportspersons. The Deputy Commissioner, Ms Seema Jain, was also present on the occasion.